IBM® Power Systems™ servers coupled with IBM PowerVM® technology are designed to help clients build a dynamic infrastructure, helping to reduce costs, manage risk, and improve service levels. 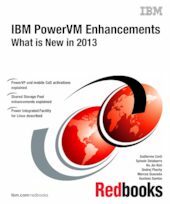 New management and performance tuning software products for PowerVM solutions. Virtual I/O Server (VIOS) Performance Advisor has been enhanced to provide support for N_Port Identifier Virtualization (NPIV) and Fibre Channel, Virtual Networking and Shared Ethernet Adapter, and Shared Storage Pool configurations. IBM Power Virtualization Performance (PowerVP™) is introduced as a new visual performance monitoring tool for Power Systems servers. The scalability, reliability, and performance enhancements introduced with the latest versions of the VIOS, IBM PowerVM Live Partition Mobility, and the Hardware Management Console (HMC). As an example, this book goes through the Shared Storage Pool improvements that include mirroring of the storage pool, dynamic contraction of the storage pool, dynamic disk growth within the storage pool, and scaling improvements. How is an IBM Redbooks publication is born?